Remember back to Me-Made-May? I discovered two gaps in my handmade wardrobe: very casual clothes and business clothes. So here’s some proof that I’ve filled in the first gap with a couple of Plantain muscle tees. This is similar to the last one I made but I straightened out the sides a little more. This is made from a 100% cotton knit and is pretty much what I had in mind when I first hacked this pattern. The knit is from Stonemountain & Daughter in Berkeley and is really soft and light – just right for a summer tank. 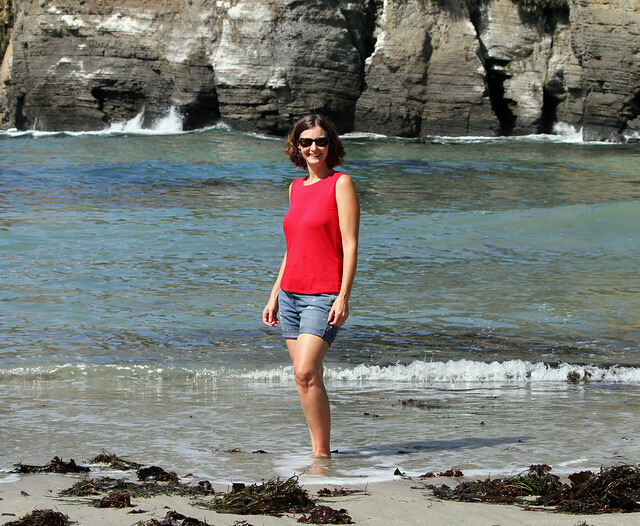 This top is perfect for all kinds of adventures, including a day on the Sonoma Coast at Stump Beach in Salt Point State Park.